Tennis world number one Rafa Nadal set a new record of winning 50 consecutive sets on a single surface. The Spaniard from Mallorca reached the total by beating Argentine Diego Schwartzman 6-3 6-4 on Thursday to reach the Madrid Open quarter-finals. As well as the Madrid Open, Nadal's 50 sets spanned tournament wins in Barcelona, Monte Carlo and the French Open. The 31-year-old's achievement breaks John McEnroe's record that lasted 34 years.
" I really don't think much about that, " said Nadal, reacting to the news. "All these kind of things probably when I finish my career will be the time to think about it. Now the only thing is that I won a very difficult match against a very difficult player and he played well." 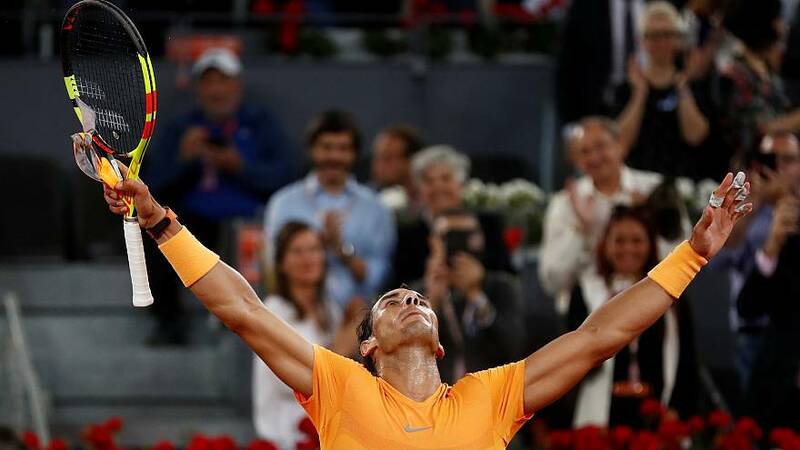 Nadal's next match in the Madrid Open will be against Australia's Dominic Thiem, who knocked out the up and coming Croatian Borna Coric 2-6, 7-6, 6-4.